Where to buy bitcoins is one of those chicken-and-egg issues that has slowed the broader adoption of the digital currency. Physical locations where you can buy bitcoins have been scarce as relatively few people use them. At the same time, many new Bitcoin users may be reluctant to jump in while places to buy bitcoins remain few in number. For Bitcoin to catch on in a major way, it needs to be more widely available. At this point, Bitcoin enthusiasts can only buy the cryptocurrency from online Bitcoin exchanges, still-rare Bitcoin ATMs (there are only 412 Bitcoin ATMs on the entire planet), or from other fans of the currency by meeting up with them in person. Now imagine if places where you can buy bitcoins were as common as bank ATMs or convenience stores. In some countries, that's already happening. Earlier this year a company called CoinPlug started selling its okBitcards at more than 24,000 convenience stores in South Korea. 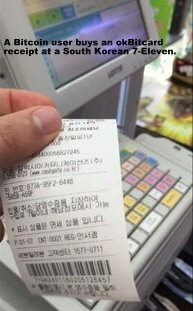 For now, the okBitcard is actually a paper receipt that's purchased at the register for a set amount of South Korean won (10,000, 20,000, or 30,000). The receipt contains a code to be typed into the CoinPlug smartphone app, which transfers the purchased bitcoins to the user's account. CoinPlug is ramping up to a system in which it will sell physical cards in the convenience stores. The company expanded the idea further in March through a partnership with the bank ATM maker, Nautilus Hyosung. Modified ATMs will have okBitcard as an option to buy Bitcoin with a credit card. These machines also spit out a paper receipt with a code. CoinPlug plans to extend the service to nearby countries, starting with major cities.